Place the teabags in a saucepan and cover with 500ml boiling water. Add the sugar and leave to infuse for 3-5 minutes. Remove the teabags and discard. Meanwhile, peel and core the apples and cut each into 8 wedges. Add to the saucepan, along with the prunes. Bring to the boil, then reduce the heat and simmer gently, uncovered, for 15-20 minutes, or until the apples are soft but still holding their shape. 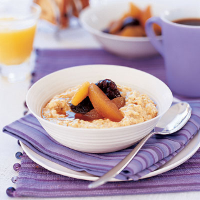 Serve the compote hot or cold on its own, or with porridge or cereal. Make the compote up to 48 hours ahead and leave covered in the fridge until required.